Core Beliefs of Living Hope Ministries. The Bible is the final authority concerning doctrine and behaviour. Everything taught must be in line with God’s Word. Salvation and heaven are available through our Lord Jesus, who is the living word. Sin, judgement and hell are realities to be dealt with. Always we preach Christ – and Him crucified! All of our messages should contain the good news of salvation through Jesus, who died for our sins and rose again. Jesus never promised to build Living Hope Ministries, but He did promise to build His church. The purpose of LHM is to build up the church of Jesus Christ through the power of the Holy Spirit. Therefore, our teaching and input should always seek to build up the local church, not the ministry of LHM. The biblical ministries of apostles, prophets, teachers and evangelists are actively encouraged, and the groups we work with should aim to have this balance. We want local churches to be free from false teaching, so that they can serve their communities effectively. 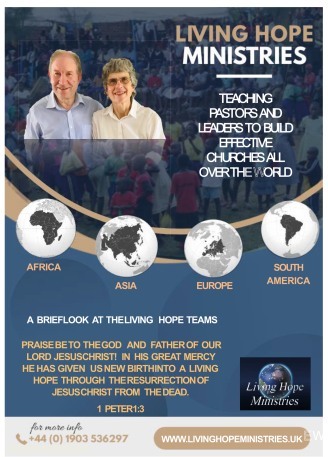 God’s heart is for the nations and all nations are open to the ministry of Living Hope Ministries as the Lord leads. His empowering gifting and anointing is essential to see signs, wonders and lasting fruit in the ministry. Please see the LHM Statement of Faith for a fuller insight into what we believe.